I read with some interest the article entitled Supermassive Black Holes Make Merging Galaxies Green over at Scientific American. While we see lots of green on planet Earth, it is not seen in outer space. In fact, I am often irked when green is used to describe deep sky objects, particularly double stars. There are no green stars. There can't be. The article however focuses on Hanny van Arkel’s citizen-science observations of little green dots in Galaxy Zoo images she was reviewing as she classified galaxies. Turned out these points were caused by ionised oxygen. Not unlike the effect close to home, with aurora. Initially, it was thought these were small galaxies and the internal stars were energising the oxygen. It turns out that "Hanny's Voorwerpjes" are being affected by something external or far away and somewhat exotic: the interactions of supermassive black holes of colliding galaxies. The black holes produced intense beams of ultraviolet energy that lit up oxygen, like lighthouses, in the outlying regions of the galaxies. 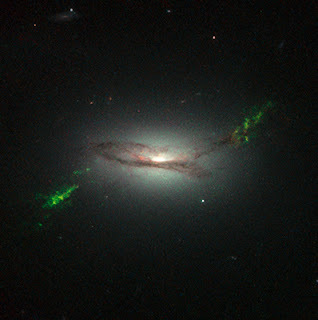 Image of SDSS 2201+11 from Hubble Site.